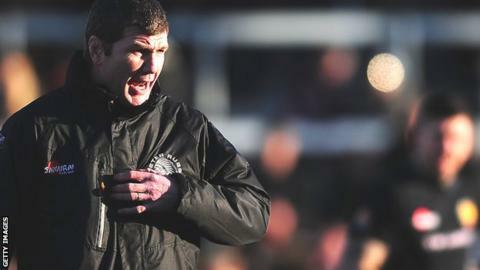 Exeter head coach Rob Baxter says his side must go "flat out" against Bayonne on Saturday to secure a home quarter-final in the European Challenge Cup. The Chiefs have already secured their place in the last eight, beating in Ireland Sunday. "We've got to go flat out next week, get the best result we can and that will hopefully help us get the draw we want at home," Baxter said. "A home quarter-final will be a very big occasion for the club." Exeter have only made the knockout stages of a European competition once in their history, in the Challenge Cup quarter-finals in 2012. "We've been to a quarter-final before, but that was away, so a home quarter-final will be very important for us," Baxter said. "Obviously we've got an important game next week. We're not going to count too many chickens because we've been in some good positions in the Premiership and things have looked nicely set for us and we've found a way to make things hard for ourselves."